*This is a repeat of a blog I originally posted in March, 2013. Melissa is now 16, but the words still ring true! During a recent trip to the book store, I found myself flipping through the pages of a hard cover collection of letters by celebrities to their 15-year old selves. Since then, I have often wondered what I would tell my 15-year old self. I look at my daughter Melissa, well into her 15th year, and I see a young lady full of life and spirit. Most evenings, when home work is complete, she'll sit on the couch and pick up her guitar and start strumming away, sometimes adding her sweet vocals to the mix. My 15-year old self longed to be so much like the 15-year old young lady I marvel at now. I longed to step into the spotlight and mesmerize audiences with my amazing talent.....but alas, my lack of said talent, along with an inability to sing on key, kept that dream at bay. Instead, God blessed my beautiful girl with that ability. Perhaps he just wanted to save it for the next generation, or perhaps the blessing is that I can now revel in my daughter's gifts from the perspective of a mother, and know that those gifts are also my own. So as I watch my daughter evolve into such a remarkable young woman, I try to remember how I perceived the world when I turned 15. Shy, insecure, with a stream of never-ending crushes on boys whose names I no longer remember. So full of wonder for my future. Would I ever feel pretty, thin, or at least comfortable in my own body? Would I ever find someone who would love me? Would I ever experience the joy of becoming a mother? Would I use my love of writing in a way where I actually might make money? Would I go to college? Make new friends? Travel? Of course, the answer to all of these questions is a resounding YES. However, I would not reveal that to my 15-year old self, for I wouldn't want to spoil the surprise, or run the risk that my words of comfort could cause actions that would change my future and the place of contentment and happiness that defines my world now. So, to my 15-year old self, I write the following words. You will experience joy and endless laughter. You will find friendships so strong their bonds are unbreakable. You will discover the love of a man only found in fairy tales. You will also learn that, at times, life may throw challenges at you. Tears and heartache will fill your heart...but it will pass, and you'll be better and stronger for it. Quite simply, please Lisa, just follow your heart and I promise, everything will be ok.
And to my own daughter, who, despite her active life full of music, friends, laughter, and love, still asks herself some of the same questions that once plagued her mother, I write the following words. I lack the ability to gaze into a crystal ball and reveal what awaits you in the years to come. But I can say with near certainty, my words of wisdom to my 15-year old self are the same words I will share with you. Quite simply, my dear sweet girl, just follow your heart and I promise, everything will be ok. Mother and daughter bonding during a recent trip to Disney! Thank you Kathy! I was inspired to run it again after reading your letter to your 21-year old self! I love your letter to younger self, but the photo of you and Melissa is priceless. Reminds me of my trip to Disney World with my daughter. We went three years ago and spent a week. It was so much fun! Hi Monica I so agree! 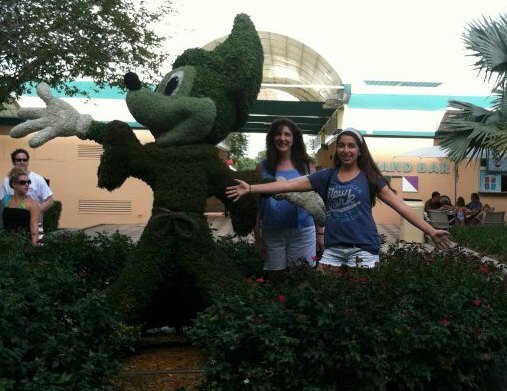 We've been to Disney countless times and it brings out the best in all of us. We have such wonderful memories from Disney!